Most of us remember Bavarian Cuckoo clocks through the countless cartoons we watched as kids. We laughed at the Bavarian reference when Sylvester the Cat was hit with a hammer or choked by Spike the Bulldog to get Tweetie bird out through the infinite extension of Sylvester's tongue simulating the clock's essence. Others might have seen one perhaps at a family's dwelling (my grandmother had one). Although I could hardly remember all the intricacies of the Bavarian Cuckoo clock my grandmother had, I do remember the elaborate carved decorations that it had. I was always intrigued by the extensive hours it must have taken to make all this work and the treat to get to hear the melodies at each hour. 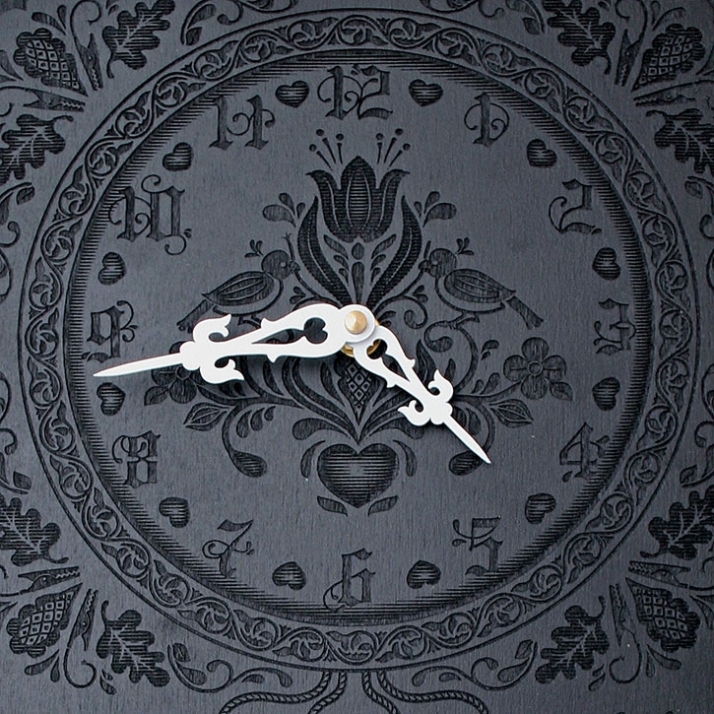 The cuckoo clock mostly describes a "traditional" style element that hangs from a wall and has a mechanism that opens a whistling of a bird (cuckoo) in intervals - at full hours on a eight day clock and both at full and half hours in one day clocks. This nearly lost craft can be taken as far as the second century BC, when the first one is credited to Greek mathematician, Ctesibius of Alexandria. "Soon Ctesibius's clocks were smothered in stopcocks and valves, controlling a host of devices from bells to puppets to mechanical doves that sang to mark the passing of each hour - the very first cuckoo clock!" "Neverend is an ongoing series of clocks created in conjunction with Kitsune Noir, Montreal design/build shop Furni, and a select group of incredibly talented artists and designers. 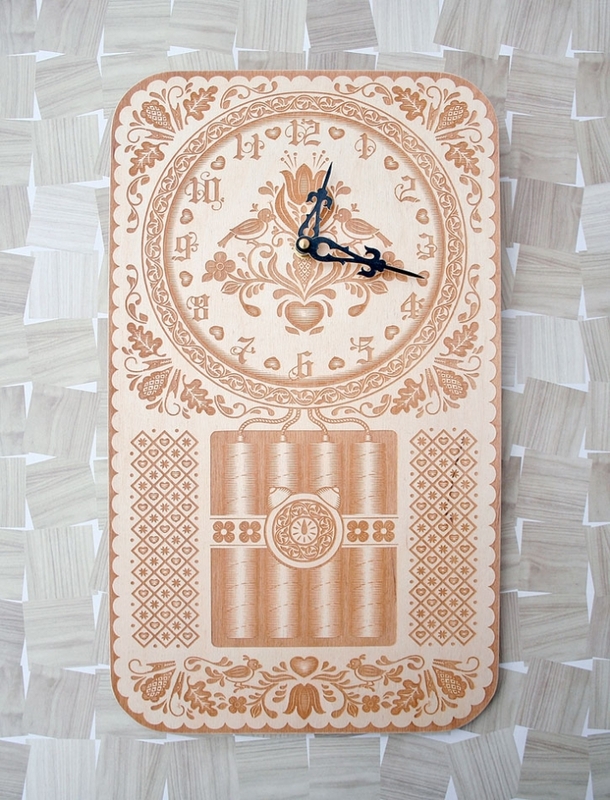 Each piece will feature artwork that is laser-etched onto a solid piece of birch wood to create a bold, graphic interpretation of the essential wall clock." The first edition comes from a the talented Brooklynite, Dan Funderburgh. The traditional cuckoo clocks contained numerous references to animals and leaves. 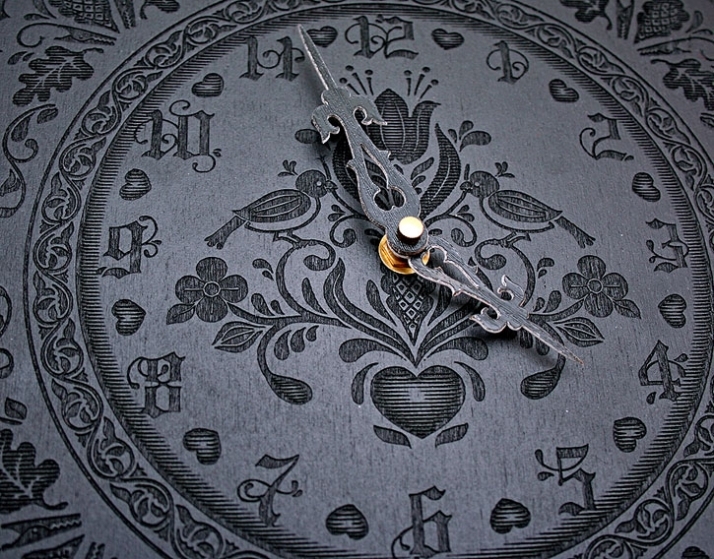 Dan referenced the craft's history and added decorative fleurons and a naturalistic layer to the pieces but enjoyed adding a twist by placing some illustrative dynamite attached to the clock. 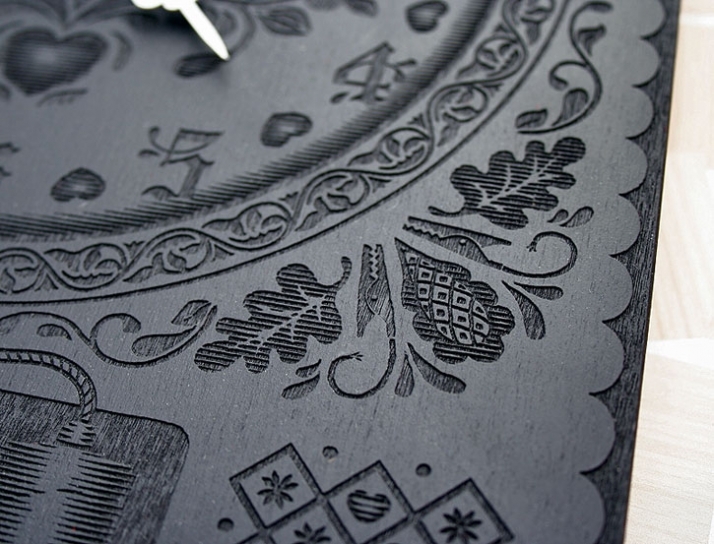 The combination of blackletter, decorative fleurons and illustrations create a contemporary take on this old craft once glorified in Black forest, Germany. 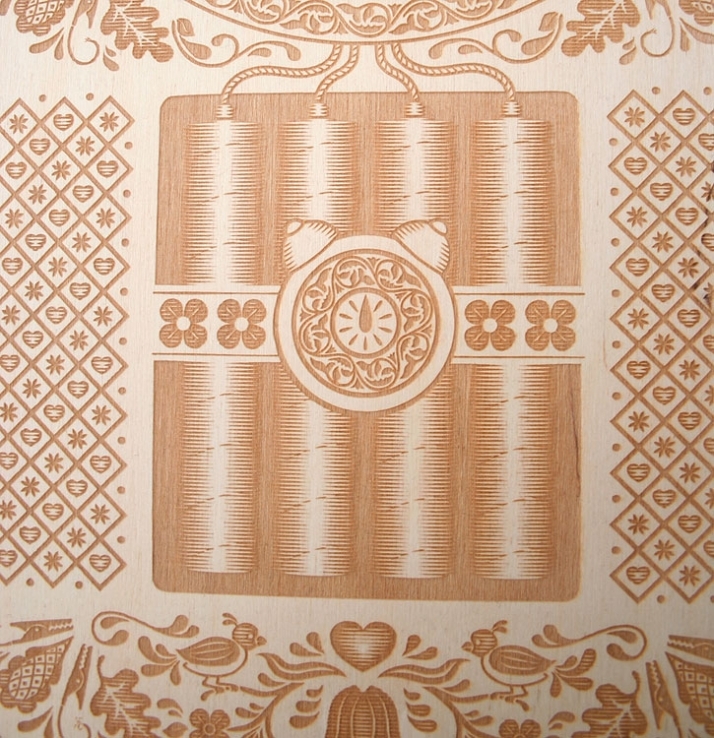 The illustrations are laser etched in birch with laser cut acrylic hands. 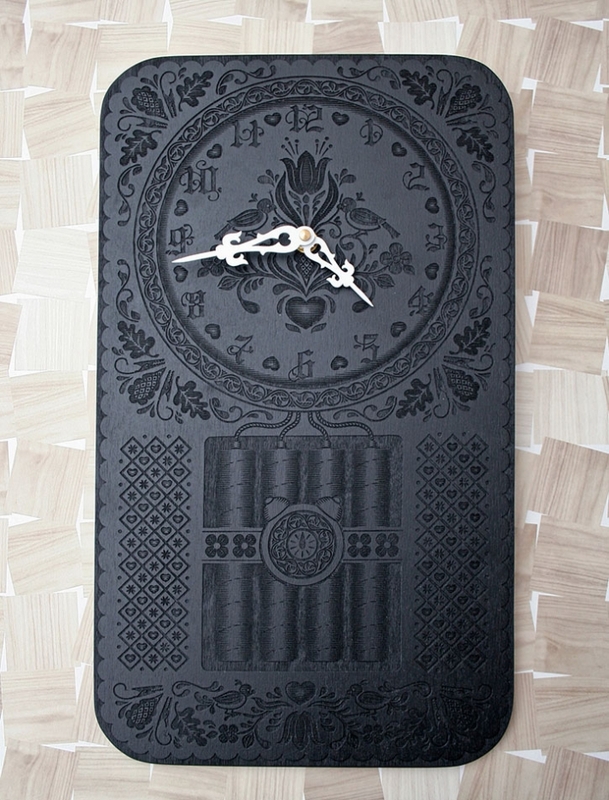 The clocks retail for $198 and can only be purchased through Furni’s Online Shop. The Neverend series intends to keep going with a monthly take and Yatzer will stay on top of it to see this collaboration continue to flourish and amaze us with play and historic references. Kudos to Bobby and Dan. Dan Funderburgh is a wallpaper designer and artist in Brooklyn, NY. 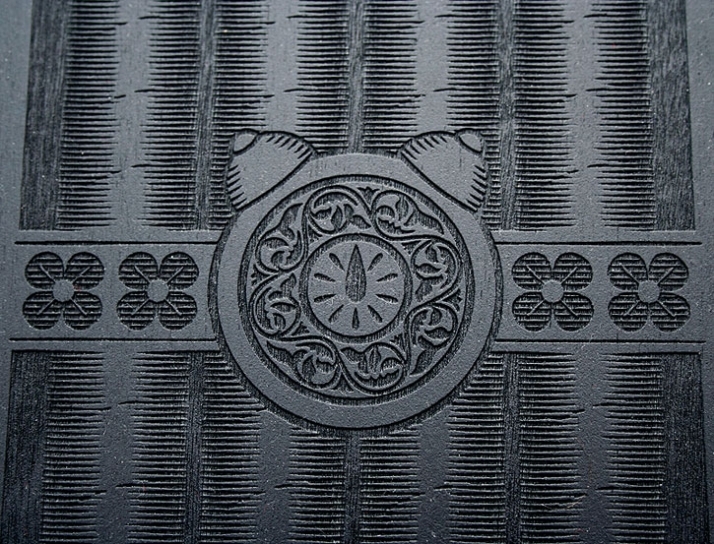 His patterns, prints and installations are varied in content but all demonstrate an unabashed love for decorative arts. With influences ranging from Moorish mosaic to American op art, the work is a repudiation of the fabricated schism between art and decoration. 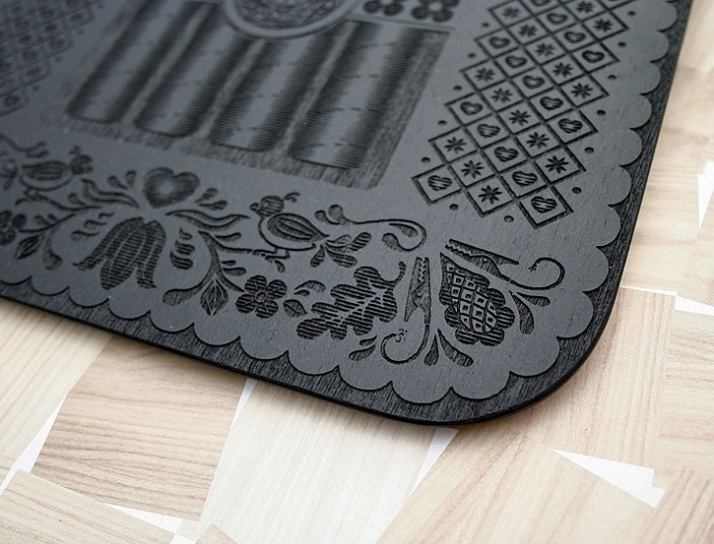 Some of Dan's work can be found in the collections of the Cooper-Hewitt Design Museum and the Miami Museum of Art. FURNI is a Montreal based design/build shop that explores creative design in wood working. Started by Mike Giles and Devin Barrette back in 2004, they've been hand making products by hand, taking pride in every piece that's made. Recently they've worked with brands such as Holger and Toddland on some exclusive products. Kitsune Noir is a culture blog that focuses on art and design, but also ventures into fashion, food, movies and music. It is run solely by Los Angeles based designer Bobby Solomon who started Kitsune Noir in 2007 as an outlet to share the creative things he found in his day to day life.